Football (Japan) Lost In Translation . . . Relaunched 2012!Football House anyone? 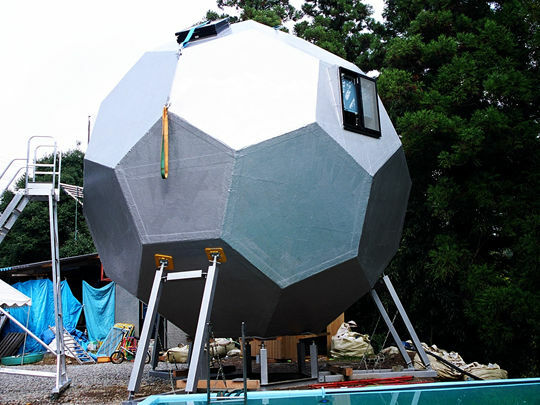 I thought it would be fun to introduce this living option on the blog, since the house is in the shape of a football (just not as round, I guess). The hexagon shape of each panel apparently makes it nearly indestructible -- and the producers are selling it as a very safe shelter particularly against natural disasters like earthquakes, floods (the thing floats! ), and so forth. You can live in it, use it as a second home, camp in it, store stuff, etc. I hear they are selling pretty well. I guess it isn't as crazy an option in Japan, since a lot of people live in tiny rooms anyway. What do you think? >>Click here to see the interior photos You can click the 1F and 2F and see how the house is split. Scroll down for actual photos.